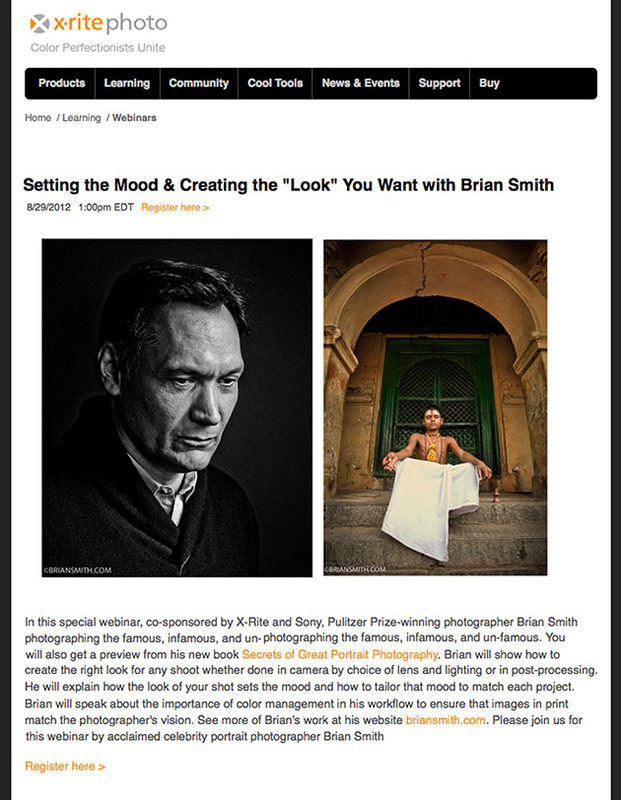 Please join me for a great webinar of my portrait photography tips to give your portraits just the right look and feel. Tune in at on August 29 for a webinar co-sponsored by X-Rite and Sony, where you’ll a sneak preview of my new book Secrets of Great Portrait Photography coming this fall from Peachpit’s New Riders Press. I’ll show you how to create the right look for any portrait photography shoot, whether done in camera by choice of lens and lighting or in post-processing. I’ll explain how the look of your shot sets the mood and how to tailor that mood to match each project. Finally, hear about the importance color management plays in my digital workflow to ensure that images in print accurately match the photographer’s vision. Webinar: Setting the Mood & Creating the “Look” You Want! hosted by Brian Smith from X-Rite Photo on Vimeo.